Confederacy, (Documents) 1863 (Feb. 9) Head Quarters, Dist. 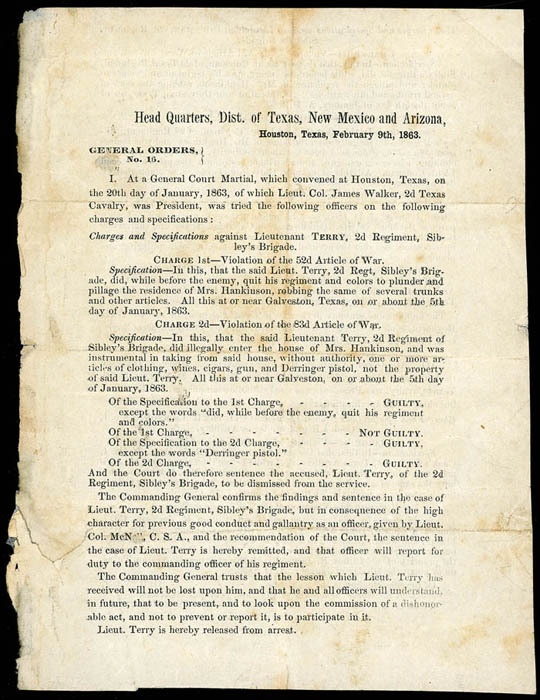 of Texas, New Mexico and Arizona, printed General Orders No. 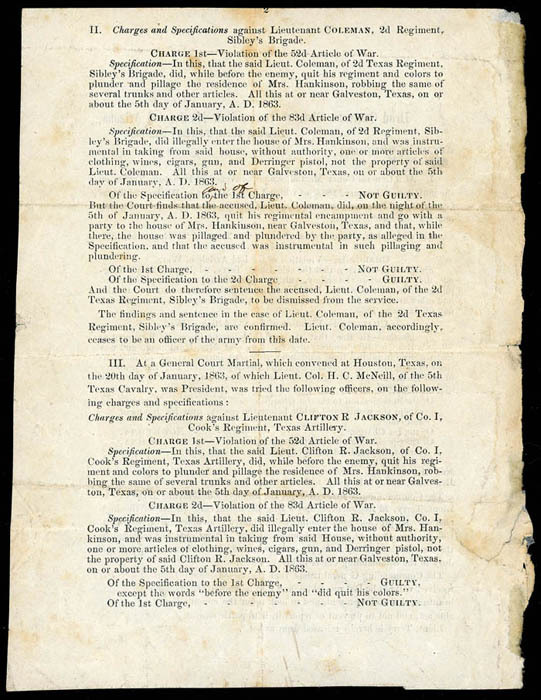 16, two sided 5.35" x 8.25", datelined "Houston, Texas, February 9th, 1863" for a general court martial that convened at Houston Texas on January 20th; small flaws, Fine and scarce District of Texas, N.M. and Arizona document. Confederacy, (Documents) 1864-65 Confederate States of America Official Documents, group of three to James S. Turner as administrator of the estate of Thomas Presley, 1864 certificate for $400 of Registered Bonds paying 4% datelined "Depositary Office, Chester SC 9 March 1864" signed by J.L. Hams; 1865 letter datelined "Quartermasters Office, Chester S C March 30th 1865" requesting delivery of corn and fodder; and 1865 official letterhead receipt for the corn and fodder amounting to $4736.13 signed by assist. quartermaster, F.-V.F. trio. 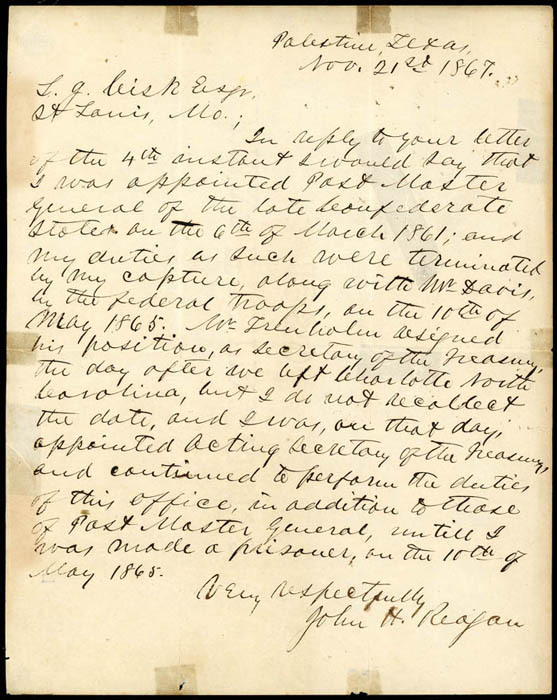 Confederacy, (Documents) John H. Reagan Letter Relating to Appointment as Postmaster General and Capture with Pres. Davis, postwar Autographed Signed Letter written from his home, datelined "Palestine, Texas, Nov. 21st 1867" to L.G. Cisk, Esq. of St. Louis, Mo., reading in part "In reply to your letter of the 4th instant I wold say that I was appointed Post Master General of the late Confederate States on the 6th of March 1861; and my duties as such were terminated by my capture along with Mr. Davis, by the federal troops, on the 10th of May 1865. Mr. Trenholm resigned his position, as secretary of the Treasury, the day after we left Charlotte North Carolina, but I don recollect the date, and I was, on that day appointed Acting Secretary of the Treasury and continued to perform the duties of this office, in addition to those of Post Master General, until I was made a prisoner, on the 10th of May 1865, Very respectfully, John H. Reagan"; some fold reinforced tape stains, F.-V.F. John Henninger Reagan (1818-1905) was an American politician from the U.S. state of Texas. A Democrat, Reagan resigned from the U.S. House of Representatives when Texas seceded from the Union and joined the Confederate States of America. He served in the cabinet of Jefferson Davis as Postmaster General. After the Confederate defeat, he called for cooperation with the federal government and thus became unpopular, but returned to public office when his predictions of harsh treatment for resistance were proved correct. 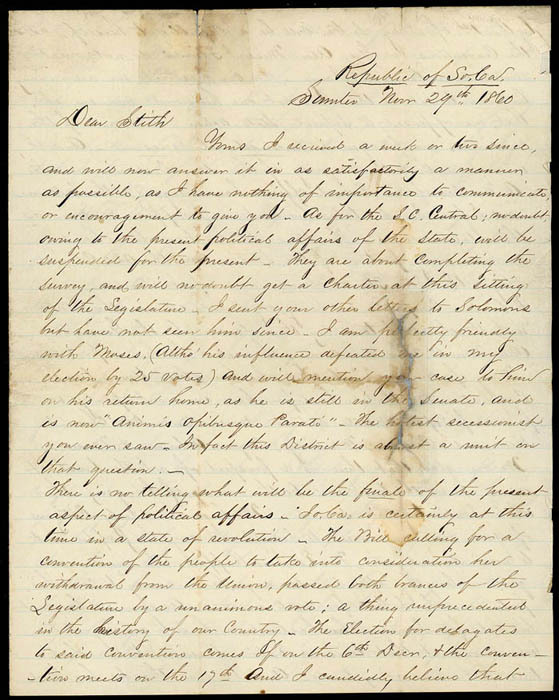 Confederacy, (Documents) South Carolina Pre-Secession Letter, 3-page letter from politician Jno. W. Dargan datelined "Republic of S. Ca., Sumter Nov 29th, 1860" with interesting contents regarding the South Carolina legislature and pre-convention sentiments…The hottest secessionist you ever saw. In fact this District is alost a unit on that question. There is no telling what will be the finale of the present aspect of political affairs - So. Ca. is certainly at this time in a state of revolution - The Bill calling for a convention of the people to take into consideration her withdrawal from the Union passed both branches of the Legislature by a unanimous vote; a thing unprecedented in the history of this Country - The Election for delegates to said Convention comes of on the 6th Decr, & the Convention meets on the 17th And I candidly believe that by the 1st of Jany So.Ca. will be a Republic to herself, as the Conventions in Ga. Ala. Miss. & Florida do not meet until some time in Jany.…A Number of our Federal officers have resigned & the balance will, before Lincoln takes his seat, or I suppose as soon as the State Seceeds - The Stars & Stripes have been hauled down in every portion of the State. And the Old Colonial Flag & the Lone Star & Palmetto ran up instead. ; couple reinforced holes along folds and staining, F.-V.F., a fascinating pre-secession letter. South Carolina was the first state to secede on December 20th, 1860 and was admitted to the Confederacy on February 4th 1861. Confederacy, (Express) Southern Express, Memphis Tenn., red double-circle datestamp on orange cover from the Carroll Hoy & Co. correspondence to New Orleans La., endorsed "$50.00" at top left; reduced at top and part of back flap missing, datestamp retouched, Very Fine appearance, a scarce Confederate money letter express use; with 2000 C.S.A. certificate. C.S.A. Catalog No. E $2,500. Confederacy, (Free Franks) "Free, Alexander H. Stephens, M.C. 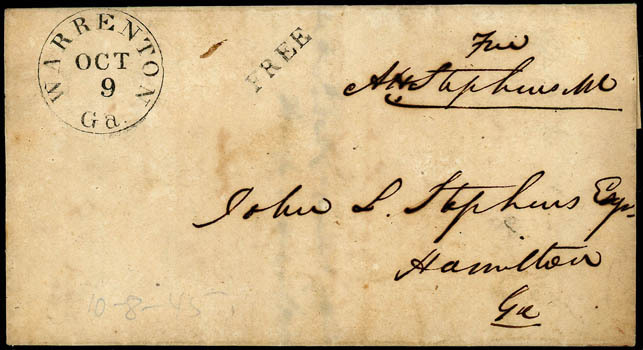 ", free frank endorsement on folded cover to John L. Stephens at Hamilton Ga., sharp "Warrenton Ga. Oct 9" cds and matching "Free" rating handstamp, pencil 1845 dating, Very Fine. A.H. Stephens served as a Whig or Democrat in the House of Representatives 1843 to 1858 and 1873 to 1882. He was also Governor of Georgia from 1882 to 1883. During the Civil War A.H. Stephens was the Vice President of the Confederacy. 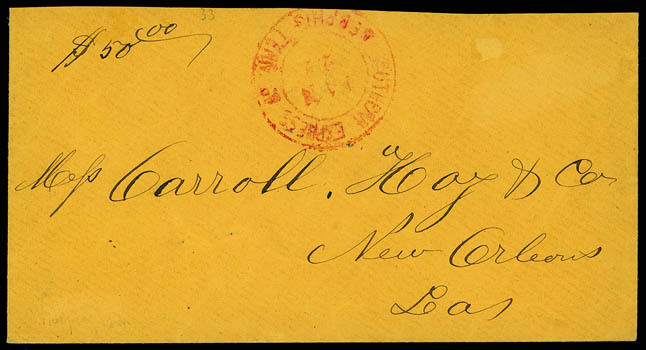 Confederacy, (Free Franks) William Henry Trescot, franking signature on legal-size cover carried by military courier to Brig. General Ripley at Head Quarters, Charleston S.C.; some staining, Fine. William Henry Trescot (1822-1898) was a Colonel serving as aide-de-camp on the staff of Confederate General Roswell S. Ripley (1823-1887). Ripley was commanding the forces in the Charleston area. He was a native of Ohio and graduated from West Point, he married a Charlestonian and chose to stay and fight for the Confederacy. Trescot was a native South Carolinian, was a former U.S. Diplomat and Asst. Secretary of State. 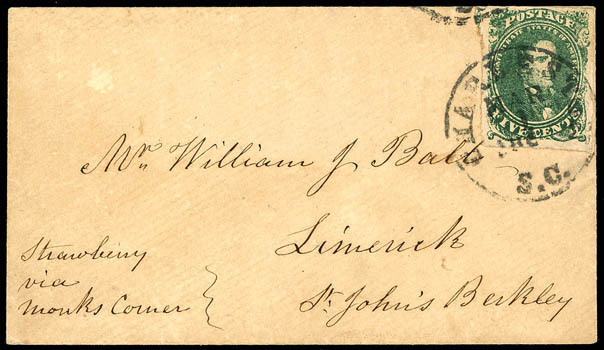 Confederacy, (Local Post) "Strawberry via Monks Corner", manuscript local post directive on cover to St. John's Berkley S.C. bearing 5¢ dark green (1), four full to large margins, tied by "Charleston S.C. Mar 1" cds; light overall cover toning, F.-V.F. After 1801, a private local post was run by Upper Cooper River plantation owners in St. John's Parish, from Strawberry Ferry to Charleston. Charleston postmaster Huger was a member. In the 1850s, when the Northeastern Railroad arrived, mail was left at Strawberry Station, across the river from a Church of England 18th Century Chapel of Ease, although it had no post office. Several Ball family members belonged, and their mail is the chief source of today's covers. There are various routings recorded, but Confederate period letters usually include St. John's Berkeley and Strawberry in the address. Confederacy, (Local Post) "Strawberry via Monks Corner", manuscript local post directive on cover bearing 5¢ blue (7), deep color, right sheet margin single with large margins slightly folded over edge, tied by "Charleston S.C. May 10, 186" cds to St. John's Berkley S.C.; small edge tear, F.-V.F. Confederacy, (Naval) 1861 (c.) To John Grimball C.S.N. 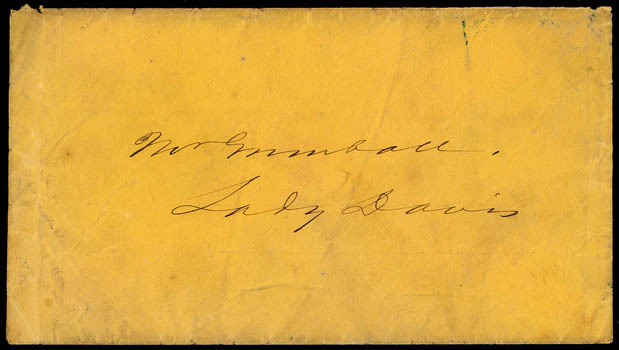 on CSS Lady Davis, orange cover addressed to "Mr. Grimball, Lady Davis", carried privately and without postal markings, Fine, an early use to John Grimball on the Lady Davis. Midshipman Grimball came back to South Carolina on leave in late 1860 and was in Charleston with his family when S.C. seceded on Dec. 20th. He immediately resigned from the U.S. Navy and joined the South Carolina Navy where he was appointed Master and assigned on Jan. 5th 1861 to the small ship "Lady Davis". Four days later Master Grimball and the "Lady Davis" were at Fort Moultrie in Charleston's harbor area when the first shot of the Civil War was fired from nearby Morris Island at the US merchantmen "Star of the West" when it attempted to resupply the Federal forces on Fort Sumter. The shots from Morris Island were heard at Fort Moultrie where S.C. forces there joined the firing.